The function of the two way control unit is to enable the operation of remote the EIPL range of Air Conditioning Systems from a single remote console. The two way control unit referred is designed to control two air conditioners as determined by the installation requirements. The temperature control is a solid state control system which enables a set temperature to be selected for the conditioned space and that temperature automatically maintenance to± o.s·c of the set point which can be set between 18 to 35"C.
Each power control module houses the components required to control the operating mode of an individual air conditioning unit. 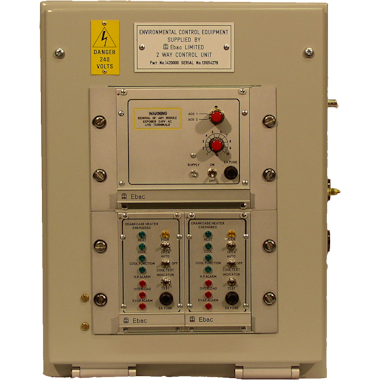 A remote temperature sensing unit is supplied with the one/two way control unit.